When Aly Pickard-Tattrie applied to University of New Brunswick, she knew that she wanted to travel abroad. What she didn’t know was that she was about to embark on an internship that would inspire her career. Veronica McGinn, UNB’s coordinator of international development, met Ms. Pickard-Tattrie at an event and thought she would be an excellent candidate for the Canadian Queen Elizabeth II Diamond Jubilee Scholarships program (QES). An essential part of UNB’s international internship program, QES supports students from all faculties. UNB is the only university in New Brunswick offering the program and one of three in Atlantic Canada. Through QES, students have the opportunity to develop new skills, knowledge, hands-on experience and expanded networks in their area of study. The experience sets students apart upon graduation and encourages the development of the next generation of innovative leaders and community builders both locally and globally. Ms. Pickard-Tattrie travelled to Malawi for a three-month internship where she worked with a Mandela/Washington Youth Intern to create a recreation program for the African University of Guidance Counselling and Youth Development. She also volunteered at a medical clinic helping youth navigate the barriers they faced to obtain health care. The work at the clinic inspired her and another UNB student to propose a health care club for local youth – a place where youth could seek support with issues they were facing and ask the doctor questions outside of the clinic. “Students not only learn to go back to the basics and accomplish many things with limited access to the Internet, power and resources, but they also build soft skills such as problem solving, analytical thinking, taking initiative, teamwork and time management,” says Ms. McGinn. One of Ms. Pickard-Tattrie’s favourite memories was the day the youth health care club opened its doors in 2015. She’s since kept in touch with the clinic’s staff and the leader of the youth club – which is still running. 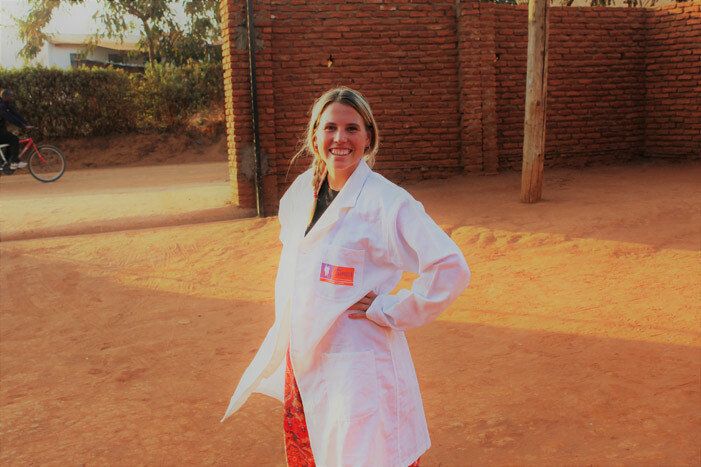 When asked if she’ll return to Malawi, the answer is a resounding “100 per cent.” The experience helped her discover a career path she’s truly passionate about – health care policy for children and youth in developing countries. “Ultimately, my goal is to work in youth health care on the international scale,” she says. This summer, 13 UNB students will travel abroad to create individual work plans with university partners while eight students from Guyana, India and Nigeria will come to study at UNB, thanks to the generous support of QES. Before leaving the country, each student completes a course covering international development, cross-cultural collaborations, travel logistics, work plans, reporting and specific information related to their field of study. "A specific focus is placed on safety and security,” says Ms. McGinn, “and all QES Scholars must complete a risk identification, mediation and response workshop." Ms. McGinn and Jessica Webster, senior instructor in the faculty of nursing, travel to Malawi with undergraduate students to help them adjust to their new surroundings. They provide an in-country orientation and ensure that their accommodations are secured. Students then begin a 90-day internship under the supervision of UNB and partnering supervisors.